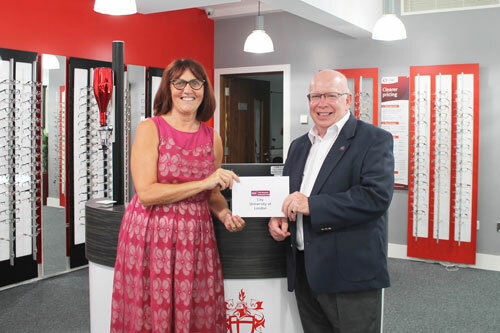 The Hospital Saturday Fund (HSF) has generously donated £9,000 to the Division of Optometry and Visual Science at City, University of London to enable 12 students over three years to travel to India to visit the L.V Prasad Eye Institute in Hyderabad. Formally handed over by John Greenwood, Chairman of HSF to Professor Debra Salmon, Dean of the School of Health Sciences in City Sight, the university’s resident eye clinic, the ten working day elective will consist of clinical observation, lectures, meetings and tutorials. LV Prasad Eye Institute is a large hospital in India with many rural branches and City students, who may not have otherwise had the opportunity to undertake an overseas elective placement without this financial support, will benefit greatly from exposure and experience in such a clinical setting. During the trip the students will keep a journal on what they observe and learn from patients, and the funding will increase students’ academic knowledge and practical skills linked to eye related diseases in the context of a developing country such as India. They will also benefit from professional interaction with clinical optometry experts overseas, and improve their cultural competency. The partnership was facilitated by the Development and Alumni Relations team. Founded in 1873, the Hospital Saturday Fund provides grants to all kinds of registered health charities throughout the United Kingdom and the Republic of Ireland each year for medical projects, care, research or support of medical training within the UK and ROI. The charity also provides vital financial support to individuals whose medical condition or disability would benefit from assistance with the purchase of specialised equipment or from practical forms of treatment. “I am truly grateful to be accepting an award of £9,000 from the Hospital Saturday Fund on behalf of the School of Health Sciences. I know I speak on behalf of our students when I say the positive impact this kind donation will have cannot be overstated, and it will certainly play an integral part in building upon the globalised outlook we endeavour to provide our students through an internationally enriched curriculum. “I would like to take this opportunity to also thank colleagues from the Optometry Division and from the Development and Alumni Relations team, particularly Maryam Farooqi and Anna Anikeeva, for their support with the grant application, and the organisation of today’s event. It has been fantastic to see the levels of student engagement involved in this process, and I look forward to hearing more from our students shortly on how they recognise this funding will benefit current and future cohorts.